When Amma arrived at Her ashram in Kozhikode, thousands of devotees were waiting with the hopes of catching just a glimpse of Her. And when Amma stepped out from the back seat of Her car, they could not help themselves–they surged forward, all of them. Can you blame them? They saw God and wanted to touch Her. It’s like this almost everywhere Amma goes, and it can be terrifying: 5,000 people trying to touch Amma as She walks–unbarricaded and barely five-feet tall–from point A to point B. Amma doesn’t help matters. She often seems as desperate to touch them as they are to touch Her, stretching out Her tiny hands to make contact, just like the bearded Old Man that Michelangelo painted on the celiling of the Sistine Chapel. Some see a riot. 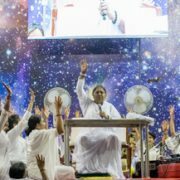 Amma sees God struggling to touch God. “All this–everything you see–should be covered with God.” It’s the first line of the first upanishad one learns. In that single mantra, everything is said: the Truth and the Goal. 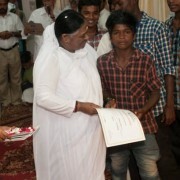 Has there ever been a moment when Amma’s actions haven’t shown this to be Her experience? Once, when Amma was leaving a city in northern India, a similar incident to the one in Kozhikode took place. But to many, it was actually quite different, as it seemed utterly devoid of innocence and raging with ego. After waiting outside the place where Amma was staying for hours, these people made it clear: they were going to have Amma’s darshan, one way or another. The smile never left Amma’s face. She didn’t shy away from anyone. She moved into them, literally pulling the people towards Her body as She moved forward. A few minutes later, heading down the road in the car, Amma said only one thing–prema. To Amma, it was clear, what She had just experienced was love and love alone. “God is love. But nobody has seen God. 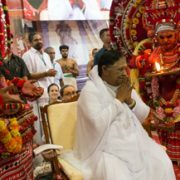 We should try to invoke that love in our hearts and be loving to everyone.” These were some of the words Amma chose to speak to the 30,000 or so devotees who’d gathered for Her darshan the second day of the 2004 Kozhikode Brahmasthanam Festival. It’s true, we’ve never seen love the way Amma sees love–as pervading all things. This is the vision Amma and the upanishad are asking us to invoke. But in Amma we have at least seen proof of the vision’s possibility. And this in itself is the first step on that journey home.